Our school has two 3-6 classes and one 6-12 class, beautiful gardens and surroundings. 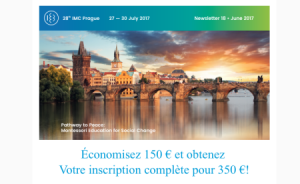 L’École Montessori de Paris, école d’application de l’Institut Supérieur Maria Montessori (ISMM), recherche dès maintenant un éducateur/éducatrice diplômé(e) AMI 6-12 francophone et/ou anglophone. Rejoindre une toute nouvelle équipe internationale vous motive ? Porter la mission pédagogique de l’ISMM vous inspire ? Travailler dans un cadre chaleureux en plein cœur de Paris vous attire ? The École Montessori de Paris, model school of the Institut Supérieur Maria Montessori (ISMM), is seeking a AMI-qualified 6-12 francophone or anglophone guide as of now. 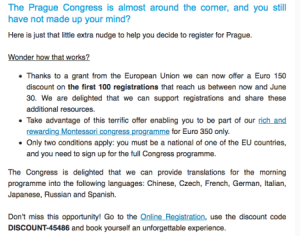 Does joining a brand new international team motivate you? Does promoting the ISMM pedagogical mission inspire you ? Does working in a warm and welcoming environment in the heart of Paris entice you? We are writing to inform you that the school, The Montessori Place, in East Sussex, England will be starting a Montessori Adolescent Programme in September 2017. 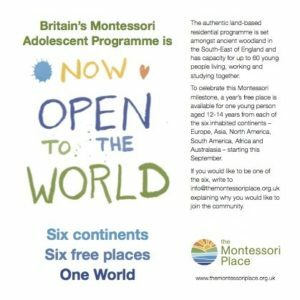 In celebration of this Montessori milestone, the school is offering 6 free places to one 12- 14 year old from each of the 6 inhabited continents, and have contacted AMI HQ to ask that we circulate this letter to all of the affiliated societies. In view of the foregoing, we kindly ask that you pass on this message to your membership and Elementary schools around the country, as this is a wonderful opportunity for 12-14 year old who would like to continue their Montessori journey, but are unable to, either because there is no adolescent programme in their country, or because they cannot afford to. Please would you send on this information and poster (attached below) to the Elementary schools in your country, and also to your membership base if you would like.